Taoiseach Enda Kenny became visibly irritated at the media's questions over his leadership during a conference with the Canadian Prime Minister in Montreal. Mr Kenny reacted with frustration after he was asked whether he intends to announce his plans to step down at next Wednesday's parliamentary party meeting. During a press conference in Montreal with Canadian Prime Minister Justin Trudeau, Mr Kenny expressed his surprise that the leadership issue was even raised at all. "I can't believe actually that you have travelled this distance to ask a question like that,"Mr Kenny said. 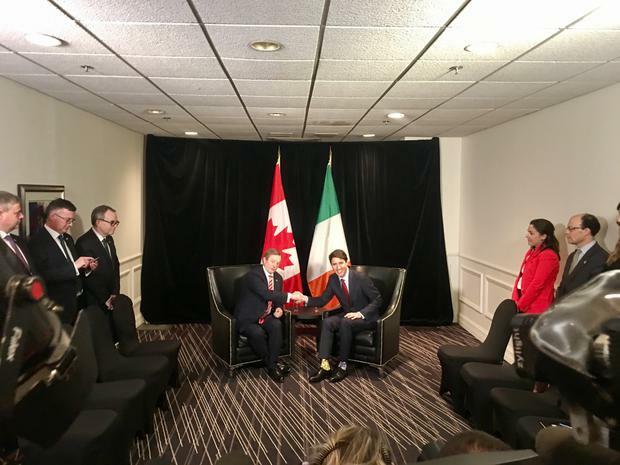 "I have come here to meet with the Canadian Prime Minister and Canadian Business to explore the opportunities that exist across the Atlantic for the creation of jobs and investment and to the benefit of Canadians and Irish people. That is my business here. Next question," he added. "I have just said to you I can't believe you have travelled this distance to ask a question like that. "My function here is to have a discussion with the Prime Minister of Canada to discuss opportunities that present themselves for investment and job creation." "I utterly refute any notion that the Taoiseach was angry or lashed out at anybody." The tense press conference was held just minutes after Mr Kenny delivered a powerful speech, which focused on themes such as immigration and political extremism. Earlier, Mr Kenny used a address to the Montreal Chamber of Commerce to emphasis the need for the centre ground of politics to hold. “And it is the centre that the Irish Nobel laureate WB Yeats once said cannot hold, now must hold, and hold with alacrity,” Mr Kenny said. “Across democracies, our best are being pushed to the hard left by anger, to the hard Right by fear,” he added. He received a spontaneous round of applause after raising the prospect of United Ireland in light of the decision by the EU to make provision for the North rejoining the EU. In his speech, Mr Kenny cited Canadian diplomat John de Chastelain, who oversaw the decommissioning of weapons as part of the Peace Process. During their bi-lateral meeting, Mr Kenny and Mr Trudeau spoke about issues such as trade and emigration. There was much discussion at the event in Montreal over the choice of Mr Trudeau’s odd socks. The prime minister later tweeted, explaining that the socks symbolised the Star Wars robots R2D2 and CP3O. "May the fourth be with you," he said.